idiopathic head tremors Archives - Oh My Dog! Of all the things I’ve ever written about in this space, Cooper’s IHT is the topic that gets the most questions by far. Every single week I hear from someone whose dog started tremoring, they googled the condition, and found our story. While it makes me feel good that I can provide a resource to folks facing the same thing with their dog, it also makes me sad that so many dogs are experiencing this. The second-most-repeated question is, and I’m paraphrasing here: What is Cooper eating these days? I think the other way people find this space is by googling something like: HALP OMG my dog has allergies! Or: why is my dog so itchy? Or: seriously, wtf is wrong with my dog’s skin? So, I’m hoping this post can be a bit of a resource. If your dog doesn’t have IHT or your dog doesn’t have allergies, feel free to skim (you never know what might spark a great idea for your pup!) or come back another day. If your dog does have IHT or your dog does have allergies, I’d LOVE for you to weigh in on your diet and routine in the comments. This community grows so strong by sharing our experiences on how best to care for our beloved family members. PLEASE NOTE: I’m not a vet. I’m not a vet tech. I’m not involved in any useful medical field in any way. I’m not a dietitian, nor am I anything skilled in any way other than being a writer who obsessively researches ways to take better care of my dog. So, please read this post from that place, knowing I’m sharing my experience. My first recommendation in all things health, diet, routine, and behavior is to see your vet. Here’s why I’m lumping together a conversation around allergies and IHT: I theorize that, in Cooper at least, the two are related. I believe that his weak immune system contributes to both, and that when his allergies flare up, his IHT flares up, as well. This is simply a correlation, of course, but an example of this is right now. His eyes are pouring goop, and I can see his ears starting to get itchy… and he’s had two tremors in the last week. That said, we’re not home cooking for him currently. At some point during our home-cooking adventures, The Honest Kitchen launched a line of limited-ingredient foods. One of the formulas was nearly identical to what we were home cooking, and we gave it a whirl. Thankfully, it worked out, and he’s been happily eating The Honest Kitchen Brave ever since. It saved us a TON of time, though it’s more expensive than cooking, but the time, oh lordy, the time it took to cook… That said, IF he ever needs to switch for any reason, I’m grateful we now know what to do! Cooper gets a ton of exercise. He runs with John. He “runs” with me on occasion in nice weather if it’s not too hot but it’s slightly cloudy so as not to be too sunny and I don’t have anything better to do. We hike weekly. I want him lean and strong, so we make sure he gets a ton of physical exercise. Since this is Cooper we’re talking about, training is important, too, since he flips out when we’re out and about if he sees a scary person (in other words… a person…) or dog. So we do tons and tons and tons of training with him, which sort of is counter to the healthy diet and exercise because it takes a lot of treats. If it’s stuff around the house or yard, or when we’re out and know we won’t see anyone (like, if it’s raining), we use a dehydrated fish treat. If it’s any other scenario–like, there might be people or dogs around–we use squeeze cheese. It’s easy to carry, easy to dispense, and extremely high-value for him. It’s also disgusting, but sometimes you gotta do what you gotta do. Recently, someone commented that I’d turned my dog into a druggie who was going to die of cancer. Why? Because I give him Apoquel AND I vaccinate him. I want to be super-duper-crystal-clear here: YOU have to decide what’s right for YOUR dog. You should make those decisions in consultation with an expert and by conducting your own thorough research (i.e. not relying only on the first result in a Google query). That said, yes, Cooper takes Apoquel daily. His skin used to crack and bleed, now it doesn’t. I get that there are side effects, but as with any medication in the world for pets or people, it comes down to weighing potential side effects against potential benefits. In the case of Cooper and Apoquel, the benefits tipped the scale. He’s also on a flea and tick medication about 10 months out of the year. We hike a lot. We live in a tick-dense area with high incidences of tick-borne illnesses. I’m not willing to let his compromised immune system try to do battle with something as serious as say, lyme disease, so we prevent the risk. Same with vaccines: I vaccinate Cooper. I believe strongly in vaccines for people and pets. I think that fear and opinion have clouded the science-based discussion around vaccines (another post for another day perhaps??? ), but it’s the best choice for our family. Plus, Cooper goes to doggy daycare and we do occasionally board him at the same daycare. It’s for his protection, and for the other dogs at daycare. I’ve heard amazing things about veterinary chiropractic care recently, and I’ve also been interested in integrative medicine–combining traditional with western medicine, including food and supplements, etc.–and found a practice nearby that we’re going to try very soon. If you guys are interested, I can share our experiences with that. I hope this sparked some ideas for you and your pet. If your dog suffers from allergies or IHT, know that I’m here for you to bounce ideas! It’s taken literally FIVE YEARS of trial-and-error to nail down this routine, so I sure hope this helps someone with similar struggles. If I didn’t cover it all, or if you’re left with questions, please do leave them in the comments below! Thank you so much for spending your time with me reading all this!! I appreciate you so much! First, let me say that this post is long overdue, and for that, I apologize. No joke, you guys, I get an email or Facebook message about Cooper and his head tremors daily. Yesterday, I got two thoughtful, nervous messages and figured it was time to finally tackle this post. Next, let me also say that I am not a vet. I’m not a vet tech. I have no medical training or expertise. All, every single one of the idiopathic head tremors FAQs below, along with the update about Cooper, are 100% my opinion. If you think your dog is facing this, bookmark this page to read later, and go to your vet. You HAVE to rule out underlying conditions (like seizures) before you can get an IHT diagnosis. Why? Because there’s no treatment, there’s no medicine, there’s nada for IHT, and some similar conditions are life-threatening and some can be treated. So, vet first. IHT FAQs later. This post is not sponsored. There may, however, be links to brands I have worked with in the past, affiliate links, or links to products I use and love. OhMyDogBlog.com is a participant in the Amazon Services LLC Associates Program, an affiliate advertising program designed to provide a means for sites to earn advertising fees by advertising and linking to amazon.com. In other words: If you purchase something from an affiliate link below, you won’t pay a penny more, but this site earns a tiny commission that we use to offset the cost of running this site. Now that that’s settled, here’s what’s going on with Cooper. We went through an entire round of elimination diet/ingredient testing and ended up home cooking for him. Until we discovered a store-bought food that works for him (more on that another day), but it’s limited to six human-grade ingredients. Plus I add some supplements. How did you diagnose idiopathic head tremors? Here’s the thing: The word idiopathic actually means unknown. Here’s the Google definition, “relating to or denoting any disease or condition that arises spontaneously or for which the cause is unknown.” There is no known cause. A diagnosis only happens by ruling out all other possibilities. That’s why I can’t emphasize seeing your vet strongly enough. You MUST rule everything else out first. In our case, we were lucky. This is not a common condition at all. We thought it was a seizure the first time it happened, but after a battery of tests, numerous conditions including seizures were ruled out. Our vet knew she didn’t know, so she consulted with a veterinary neurologist at Ohio State University. She sent all his test results and the battery of video we had taken of the tremors, and he took a look at all of it and said IHT. He said we could do an MRI and run way more tests but that he knew they would all come back without results. Hence, IHT. But, we only got to that point after lots of tests, vet visits, and the consultation with the specialist. What causes the head tremors in dogs? And how do you treat them? This ties into the answer above. There’s no known cause. I have heard of people putting their dog on anti-seizure meds, but the OSU vet we consulted with said they don’t help, so we’ve never put Cooper on any meds for idiopathic head tremors. That said, the easiest way to “treat” the tremors in my book is to stop them. We do that with a treat and getting Cooper to focus. Typically we’ll ask for a simple behavior–shake, down, whatever–then have him chase the treat reward. Usually by the time he’s back, he’s stopped tremoring. Sometimes it takes a few repetitions, but it always snaps him out of it. I know that’s not “treating” the tremors, but it at least stops the incident. As for treating, I think my closest answer is in the food Q below. Short answer, yes. Cooper is on an allergy medication, Apoquel, and when his allergies are at their worst, we add in a Zyrtec. He also gets a monthly flea/tick topical. He’s allergic to most “flavor” additives, so he can’t take a typical heart worm pill. He’s on Revolution, which takes care of heart worms and flea/tick. There has been a lot of discussion in the comments about flea/tick causing tremors. There’s no evidence to back that up, so I get nervous when readers post to “stop all topicals!” That’s a decision you need to make with your vet. For Cooper, his system is SO sensitive that we minimize the onslaught, but I do believe that the value of topical treatments outweighs the risk. Again, that’s just my opinion, and our vet is on board. You have to make that call. Do I think they contribute to his tremors? I can’t say for sure, of course, but I haven’t noticed a correlation like… apply topical, get tremors. It just hasn’t happened. As for the supplement piece, here is exactly what we feed Cooper: He eats The Honest Kitchen’s minimalist formula, Brave. I believe that has had the single biggest impact. Feeding him clean, healthy, wholesome food with no additives has helped him gain weight, cleared up his skin and ear infections, and more. If his system is struggling to process food, I think that can only help. To that we add two heaping spoonfuls of organic, unrefined coconut oil at night. For breakfast and dinner we also add in a vegetarian vitamin (he’s allergic to flavoring, and many vitamins have liver/beef/chicken flavor) called Udo’s Choice and a calcium supplement, KAL Bone Meal Powder. He gets his allergy meds in the morning, along with a probiotic from Only Natural Pet. We’ve also started him on a joint supplement from Super Snouts. Changing his diet, testing, and determining what works and, more importantly, what doesn’t has impacted his health significantly for the better, so I can only assume that it’s had an effect on diminishing his tremors. Do you think vaccines/medications/food trigger the tremors? Should I stop vaccinating my dog? me, is worth it. As for vaccines, I get this question all the time, and I can’t lie… I am a believer in vaccines for both people and dogs. Again, this is a matter of personal choice in conjunction with your vet, but I believe in vaccinating, and Cooper does get vaccinated. That said, we do three-years to prolong the time in between, and he’s allergic to the rabies vaccine so has to have a shot of a super strong antihistamine before he gets his vax. Whether or not you should stop vaccinating your dog in an effort to curb tremors has to be a decision you make with your vet. Is he in pain? Does tremoring cause long-term effects? There’s no way to know, but every vet and specialist we’ve talked to has told us no. He doesn’t seem to be in pain. When it first started happening, he did seem frightened. I wouldn’t say he’s used to it now, but he’s fully aware when he’s tremoring/shaking/head bobbing/whatever you want to call it. We can get him to respond to cues to distract him out of it, so I don’t think he could be in too much pain. I totally get it being scary for him, though. Long-term? I don’t know. He’s five now. He’s been tremoring since 2012, and I would say he’s in better health now than he’s ever been, largely because of the food/supplement stuff mentioned above. Okay, still with me? WHEW! Thanks for sticking with this post, and I really do hope it’s been helpful. On all the posts I’ve done about IHT–the three linked to above and a couple in the early days when we were awaiting diagnosis–have almost 1,000 comments combined. I tried my best to lump together the questions that came up most often, but it’s likely I missed something. Please don’t hesitate to leave a comment with any questions I might have overlooked or comments/feedback on what you’ve been doing with your dog! If you’re dealing with idiopathic head tremors (or sometimes referred to as head bobbing), you have my sympathy. It’s stressful to not know why something is wrong with your pup, and it’s even more stressful to watch them go through it knowing that there’s nothing you can do. On both of those posts, I tried to keep up with the comments but totally lost track! The general thread, though, is that everyone is reporting something different: Some people suspect grains were causing tremors, then others reported an increase in head bobbing with a grain-free diet. A handful of people had luck adding calcium supplements, and others reported vaccines worsened tremoring episodes. With Cooper, I suspect it’s related to his already compromised immune system, but there’s no proof behind that… it’s just a theory. From our end, I thought we had gone months without a single tremor, and I was thrilled… until Cooper started climbing into bed with me in the middle of the night. Twice recently I was woken up by him tremoring in the early morning hours. That got me thinking that maybe he hadn’t been tremor-free but that we just weren’t awake when they were happening. Again. So. Frustrating. It’s nothing fancy – I’m not so good with Excel – but if you’d like to download the file, click here to download. You’re welcome to customize it however you need. I just hope it helps! In the meantime, I’d love to know how your dogs have been doing. Any updates? Improvements? Have you spotted any trends that might help the community? Please share your experiences in the comments! UPDATE! Start here —–>>>>> Welcome! I’m glad you’re here, though I wish it were for reasons other than researching head tremors. You may have arrived here from my original head tremor post. If not, there’s more video and detail there. 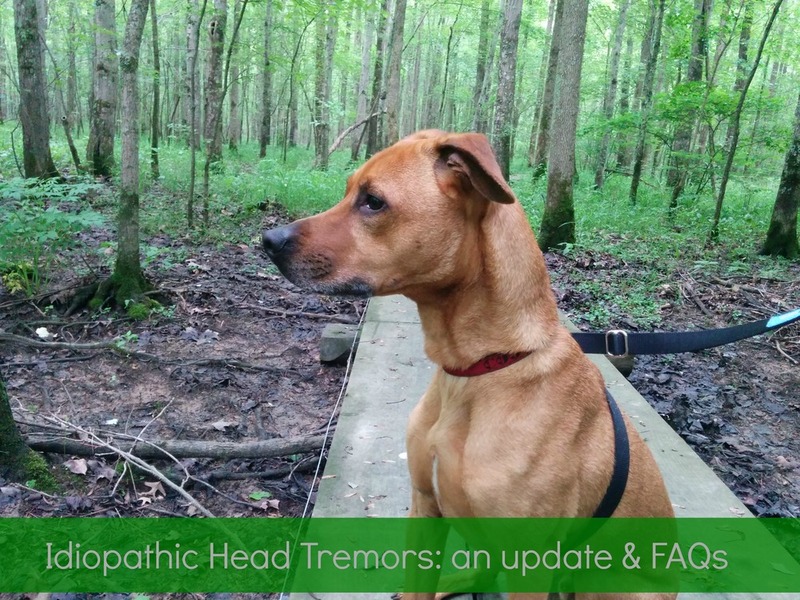 After you read these and compared your dog’s tremors to Coop’s, please do check out a more recently updated FAQs about head tremors, treatments, what’s worked, etc. I also recently shared his diet and routine that has helped nip the tremors in the bud! Editor’s note: This is a guest post that I requested on behalf of everyone whose dogs are suffering from idiopathic head tremors. Based on the comments from my previous post (found here) I knew this was a topic that warranted further review. If you have additional questions, please leave them in the comments so we can continue our discussion! OhMyDogBlog.com is a participant in the Amazon Services LLC Associates Program, an affiliate advertising program designed to provide a means for sites to earn advertising fees by advertising and linking to amazon.com. Many dog owners have to watch their precious friends suffer from idiopathic head tremors on a regular basis. This problem can make owners feel helpless as their pets experience uncontrollable “head bobbing.” Some dogs bob their heads side-to-side, while others bob up-and-down. Either way, many have described the bobbing as resembling the “dog version” of Parkinson’s disease in humans. Idiopathic head tremors can occur with just about any “bully dog breeds.” Some of these breeds include Bulldogs, Pit Bulls and Doberman Pinchers. Researchers continue to conduct studies. Yet, currently, no one really knows for sure why the tremors occur. Theoretically, the tremors are harmless. However, they can sometimes resemble seizures, which can be very stressful on owners. If your dog experiences these annoying tremors, it’s important to remain calm. According to experts, the head bobbing doesn’t actually affect your pet. Yet, panicking will only cause your best friend to panic as well, which may cause the tremors to increase. Instead, evaluate the condition of your dog. Is your buddy responsive and alert? What color are your furry buddy’s gums? Have any other parts of your pet’s body been affected by the tremors? A typical idiopathic head tremor episode will generally last around three minutes. Once the head bobbing is over, your dog should return to normal, as if the tremors never occurred at all. If your dog does appear to have been affected, contact your local veterinarian immediately. If your dog suffers from tremor episodes several times per day or over a period of a few days, that’s a good reason to visit your vet. Most pets never experience tremors while actually in the vet’s office. So, try to get your dog’s episodes on video. That way, your veterinarian can review the footage and use it to help him/her make an educated diagnosis. Are Idiopathic Head Tremors Hurting Your Dog? Many dog owners have reported their pets having recurring idiopathic head tremors for a while. Then, they suddenly just stop altogether. Until that happens, keep a journal which details the tremors. This will help you better understand what some of the possible triggers may be for the head bobbing condition. In the meantime, remain calm, because these seizure-like symptoms are not life-threatening. That means they have no long-term effects on your dog. The actual point of treatment is to lower the stress and anxiety levels of dog owners who hate watching their pets suffer. Dog owners with pets who suffer from idiopathic head tremors say that their buddies are entirely aware during episodes. Their ears stay up as if alert. They respond to your calls and commands as usual. And, their appetites aren’t affected. The next time your dog suffers a tremor episode, simply try calling her/him over to you. Then, have your pet sit still so that she/he can focus. Usually, this will help to release your pet from the “tremor trance.” Some owners even say that doggie treats can also release them from the trance. This article was written by Ryean Bishop for Bannock Animal Medical Center (BAMCvet). Worried about your pet’s idiopathic head tremors or other medical issues? Contact BAMCvet to schedule your pet’s appointment today. Idiopathic head tremors: A typical Cooper tremor from Maggie Marton on Vimeo.